Is User-Friendly Content and SEO a Contradiction? User-orientated content is currently the solution to many SEO questions, as is the new saying: optimize topics instead of keywords. Actually, nothing needs to be optimized anymore – just create cool holistic content for the user, and all will be well. But is that really true? Figure 1: John Mueller’s Tweet to question regarding the most important ranking factor. SEO success today is highly dependent on the quantity and quality of the content offered. The idea of creating content for users rather than for search engines is repeated nearly so often as “Content is King” in this context. This is often justified with the fact that Google has become so smart. As always, search machines, which have been somewhat improved, are intermediaries between your content and those people who will be consuming it. This applies at the very least to users who you obtain or would like to obtain via search engines, which is still a substantial amount for many websites in spite of social media and alternative search systems. So why not consider the way the search engine works? Whoever creates content for users instead of search engines is trying to kill two birds with one stone, as they are also automatically optimizing for Google. As a result of Hummingbird, Google is able to better understand texts, and can therefore rank for a keyword accordingly even if this does not appear in the text. However, rankings for keywords that are not named in the text are the exception rather than the rule. These cases are more likely to be found with longtail keywords for which Google wouldn’t be widely used, or for synonyms and of course, if you formulate a question to which Google knows the answer. that will work without input from you. You have to promote your content, technically and with regards to the writing. That may be a tactical assumption and this may change over time, but it is certainly still the case today. Who Knows the User Better – You or Google? Since Google is always becoming better at evaluating the needs of users with certain search terms, it is often the case that Google will know better than you what the user expects from a certain topic. You can also turn it around and say, if you create your content so that Google likes it, your users will also like it. The truth, perhaps, is a compromise: create content for your users, but take into account how search engines work. With tables, you create a visual anchor in a continuous text and clearly get to the heart of the information. 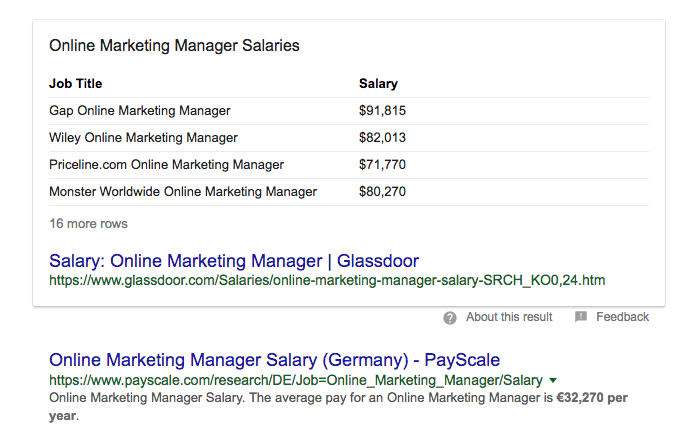 The added value of presentation in tables is now also used by Google, which shows this information in excerpts as featured snippets. Instead of just creating tables, if it seems appropriate, you can check with targeted research for which keywords such featured snippets appear and correspondingly optimize the table. You can, for example, ensure that you name the table properly, and that the design is not too complex. You will therefore increase the probability that the table will be shown as a featured snippet, as well as optimizing the user experience. Wouldn’t it be interesting to know that broad bean can also be called fava bean, faba bean or field bean? You would assume that a good writer will realize this when researching and will use these terms in their text, for example to show subtle differences in the meaning of terms. However, they may not realize that around 7 times more users search for broad bean than for fava bean. 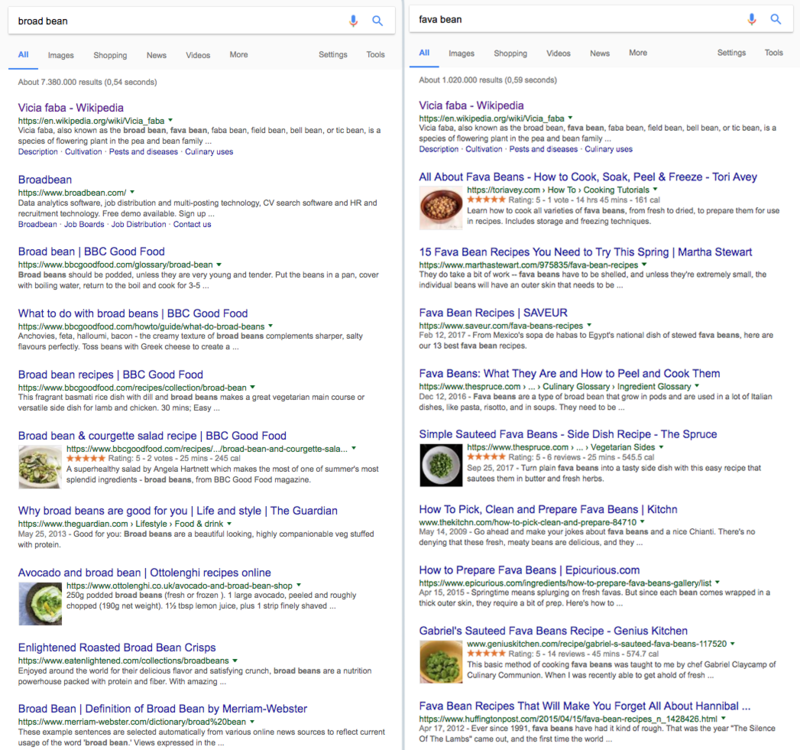 This can make a big difference: looking at the search results for fava bean and broad bean, you can see that only one website (Wikipedia) manages to rank on the first page for both terms. Therefore, if, without spending time thinking about SEO, you establish that you want to use the term broad bean, or if an expert tells you that fava bean is correct, in both cases you will lose out on many search inquiries. While SEO in previous times was able to successfully exploit the orthographic weaknesses of users (typing error optimization), or created separate landing pages for synonyms and longtail keywords, the SEO of today is instead suited to covering as many keywords as possible with one URL. But how much is too much? You have collected a multitude of keywords around your topic. Now, you have to decide which of them you would like to optimize. While current studies show that you can be well placed for several hundred and even more than a thousand keywords at the same time with your own URL, there are nevertheless certain limitations. For more than 1 keyword with a very high search volume (< 10,000 monthly search inquiries), to rank in position 1 with the same URL is, for example, very improbable. This is also logical, because high interest usually means that you are dealing with a large topic with its own longtail keywords and various questions – too much to be handled in one paragraph as a partial aspect. Data about keywords will thus also help you to draw a connection to other topics. What tools can I use to optimize my website? What are the biggest website issues? A good writer will perhaps do this without even thinking about SEO. Nevertheless, he probably misses a few questions that might be asked by users and he can only guess the user’s priorities. Thus, for example, to the question “Why do I need a website?,” Google Keyword Planner shows an average monthly search of 140 per month. Naming this question, for example as a subheading, with suitable support as an answer, should not only ensure a better ranking on this and similar phrases, but are also commercially interesting. If used correctly, mathematical formulas can make a good text even better. With regards to SEO, a TF*IDF analysis can help you to create relevant content for a certain keyword. That means ensuring a sufficient use of “website”, preventing an overemphasis of certain terms (span line) and using enough terms that clearly demonstrate your relevance in connection with the chosen topic. This analysis also provides further valuable indications with regard to what content to include. … do not forget keywords in your content. Of course you should create content for the user and not for Google – at least you shouldn’t produce an unreadable text one kilometer long. However, the idea of creating content for people rather than search engines can be easily misunderstood. So, don’t make it too easy on yourself, because as always, simple sayings are suitable for headings, but not for successful solutions. Published on 11/08/2017 by Leonard Metzner. As a freelancer, Leonard Metzner helps companies generate more organic traffic. The former in-house SEO does not think that search engine optimization will soon be irrelevant. As a commercial information technology specialist, he has developed a passion for automation and SEO tools.